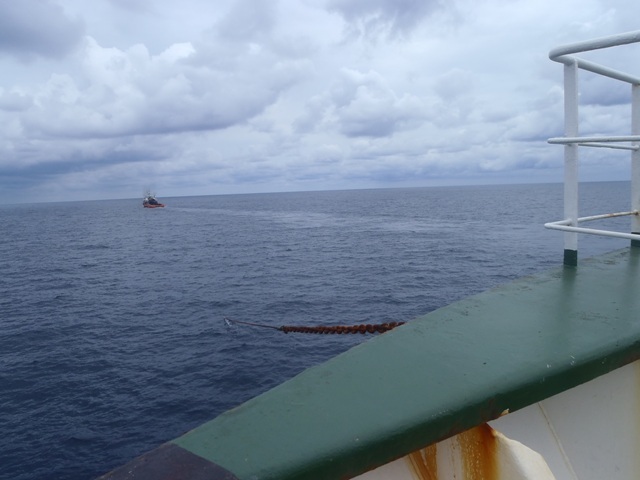 In 2014, FIVE OCEANS SALVAGE undertook successfully 4 salvage operations. Bulk carrier YIALIA (69,450 dwt, built 1990), laden with 60,050mt of aggregates, was immobilized in the Persian Gulf on 09th August 2014 while en route from Mina Saqr, UAE to Mesaieed, Qatar. Five Oceans Salvage signed a LOF with Owners same day and immediately dispatched tug IONIAN SEA FOS from her salvage station in Khor Fakkan, UAE. 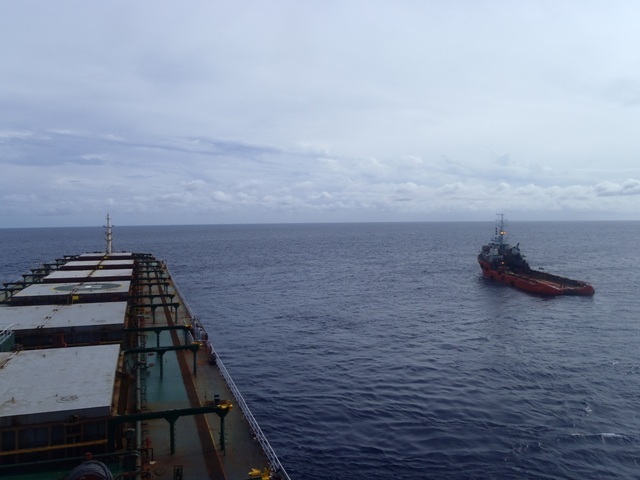 The tug towed the casualty to Port Rashid and in the course of the following two weeks, remained standing by and provided support to the casualty during repairs and sea trials. 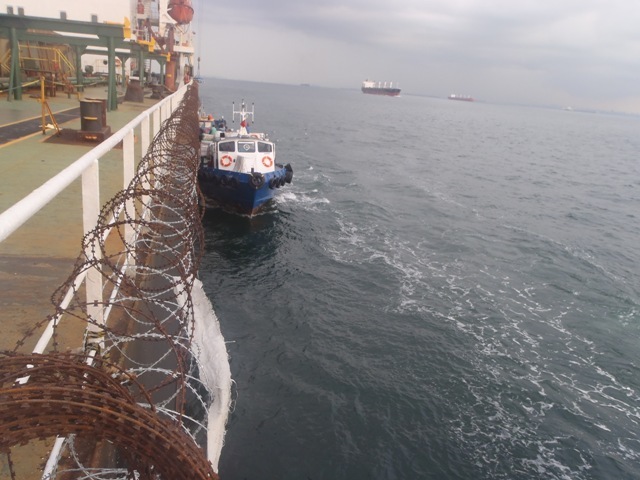 The vessel was redelivered to her Owners on 22nd August 2014 in Port Rashid. Bulk carrier OMEGAS (73,600 dwt, built 1997), laden with 62,170mt of soyabean meal, was immobilized in Indian Ocean due to tailshaft detachment while bound to Vietnam from Argentina, on 31st July 2014. 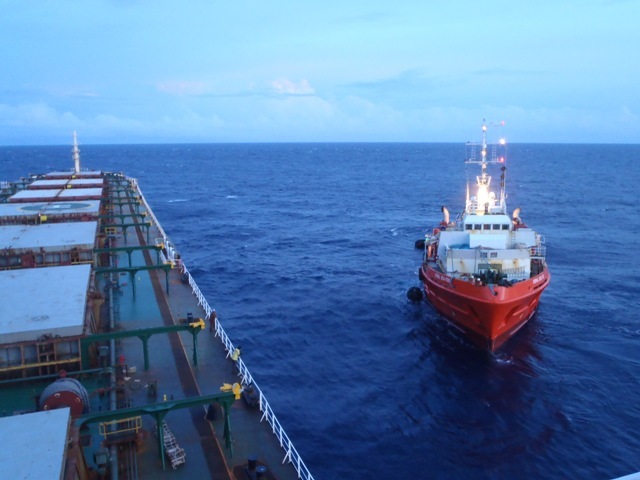 Five Oceans Salvage signed a LOF with Owners same day and immediately dispatched AHT CAPRICORN from Colombo as a first response and CORAL SEA FOS from her salvage station in Port Louis, Mauritius to assist. 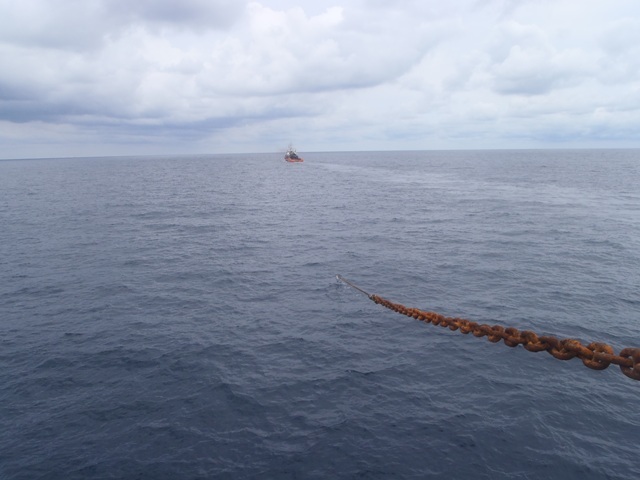 AHT CAPRICORN reached casualty’s location on the 4th of August, connected with the casualty and started towing the OMEGAS towards Indonesia. CORAL SEA FOS met with the convoy on the 12th August off Banda Aceh and took over the casualty. A salvage team of 4 persons, consisting of a Salvage Master, a Salvage Engineer and 2 Salvage divers, that mobilized from Greece, boarded the casualty on 14th August. After securing and providing additional reinforcement to the tailshaft both from inside the engine room and externally, the casualty was towed to Phu My in Vietnam to deliver part cargo. 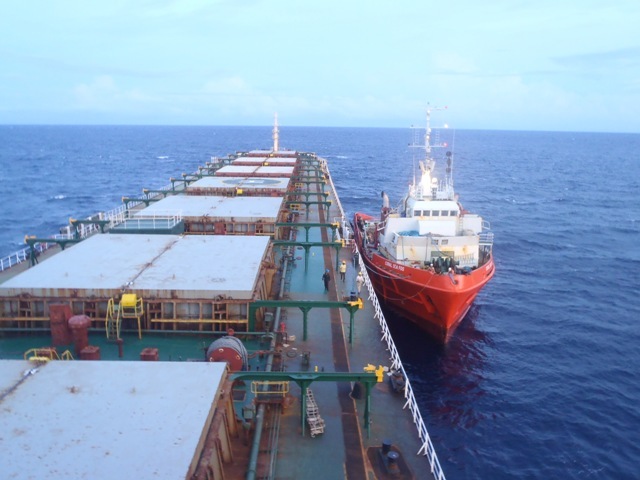 On completion of the discharge in Phu My, the vessel was towed in Cailan, Vietnam for delivery of the balance cargo. Whilst towing from Phu My to Cailan the convoy had to adjust course and speed to avoid typhoon Kalmaegi. In Cailan, salvors had to also arrange the cargo discharge as the vessel would not be allowed in port without propulsion. On completion of the discharge of the entire cargo in Vietnam, the OMEGAS was towed by CORAL SEA FOS to Guangzhou, China and was redelivered to her Owners at Cosco Dongjangkou shipyard on the 26th October.